Fisher sued the University in 2008 for discriminating against her based on her race, which she claimed was in violation of the 14th Amendment. In June, the Supreme Court determined the Fifth Circuit had failed to apply strict scrutiny to the University’s race-conscious admissions policy and sent the case back to the Fifth Circuit court to determine whether the University’s policies are narrowly tailored and necessary to achieve a “critical mass” of minority students. In their questions during oral argument, Judges Patrick Higginbotham, Carolyn King and Emilio Garza focused on the way the University defines “critical mass,” as well as past attempts the University has made to increase minority enrollment. “Every attempt I’ve heard to define a critical mass has been tautological, circular or objective,” Garza said. Greg Garre, the University’s attorney, said although UT does not use specific numbers to determine a critical mass, the University is still able to determine when this mass has been met. “[Not using percentages] doesn’t mean that UT can’t determine when a critical mass is reached,” Garre said. Fisher’s attorney Bert Rein said if the University considers race in its admissions process for people who do not qualify for admission under the state’s Top 10 Percent rule, the school must provide undeniable evidence that diversity could not have been achieved through any other means. “If you pick race, you have to be able to withstand strict scrutiny,” Rein said. According to Garre, the University uses race as part of a much larger admissions process, and race is one of several factors that, combined, determine 4/7 of an applicant’s personal achievement index. That score is in turn combined with the applicant’s academic index score to determine if the applicant should be admitted to the University. “One factor of a factor is race,” Garre said. Higginbotham said because most low-performing schools in Texas are heavily made up of minority students, if the University did not use holistic review to gain minority students, then students might begin to assume all minority students at the University are from low-performing schools. “That to me creates the stigma that [Justice Clarence Thomas] has rightly complained about,” he said. President William Powers Jr. — who is a Harvard Law graduate and a former dean of the UT Law School — said he thinks the questions the judges asked clearly indicate they researched the University’s specific admission policies. 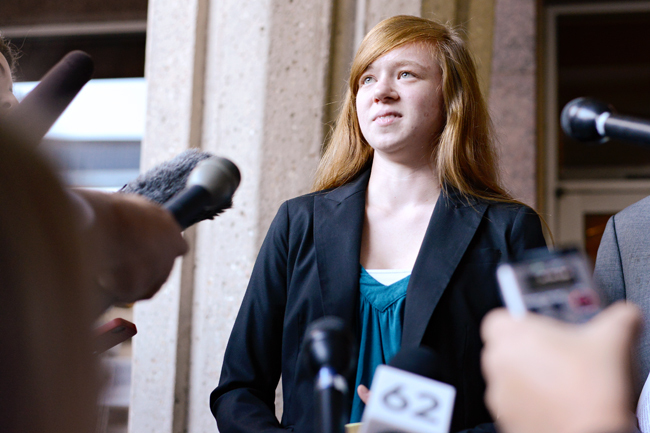 The University has been the center of many previous cases related to affirmative action. In 1996, Hopwood v. Texas was the first affirmative action case to strike down race as a factor during an admissions process, though the right to use race with certain qualifications had been established in Regents of the University of California v. Bakke in 1978. Grutter v. Bollinger, a case brought against the University of Michigan in 2003, declared use of race as an admissions criteria constitutional, reversing the Hopwood ruling. Garre argued that during the seven years between those two cases, while the University did not use race as part of its admissions process, the percentage of African-American students in the student body fell by approximately 50 percent. Rein said the University has not made any attempts to use race-neutral admissions criteria since the Grutter case declared that using race as a factor is constitutional. Powers disagreed and said the University has been unable to achieve its goals of student diversity through processes that do not take race into consideration. Additional reporting by Jordan Rudner.